Do you have an unfinished basement that’s only used for storage? Or perhaps, you have an old or partially finished basement that needs remodeling. Besides giving your family additional living space, a remodeled or finished basement can significantly add resell value to your home. 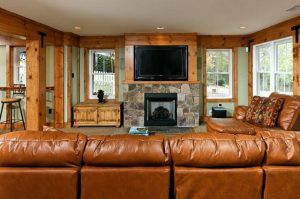 If you’re considering renovating your basement, here are some basic basement remodeling considerations for Maryland homeowners. Before you even begin to remodel your basement, be sure your basement has a sound structure. Check to be sure the basement walls don’t lean, and the floor is not cracked. Make sure your furnace and electrical service is able to handle the additional demands entailed in remodeling. Most importantly, your basement should not leak. After you identify any issues, such as these, the next step is to repair them. If your basement lacks windows, it’s a good idea to install them. Besides ushering in abundant light, windows in a basement can also make it easier to escape in emergencies. Maybe you have old basement windows, but they leak air due to cracks and gaps around the glass or between window frames. By installing new windows, you can save on your energy bill as you can eliminate air leaks. Before installing windows, check with your city building department to see if there are any regulations, regarding windows. Decide if you need to include a bathroom in your remodeled basement. This can be a good option if you plan on using your basement for overnight guests. On the other hand, adding a bathroom takes up space that could be used for a pool table or exercise equipment. If you plan on adding a bathroom to your basement, you’ll need to determine if the primary drain for your home runs either above ground or is underground. To do this, you’ll need to locate the soil stack. If it is underground, it shouldn’t be any harder than adding a bathroom upstairs, provided you locate your basement bathroom near the main drain. On the other hand, if the main drain runs above the ground, a grinder and a pump will be needed. Ceramic tiles—You can find ceramic tiles in a wide range of styles and colors. Besides being easy to maintain, ceramic tile flooring is exceptionally durable. On a down note, ceramic tile can make a basement seem even colder. Wood flooring—Wood floors can add beauty to a basement and give it a warm feeling. Laminate flooring—This type of flooring, which is less expensive than wood flooring, is made to mimic the appearance of stone, wood and ceramic tile. As there are some types of laminate that have been treated for resisting moisture, they do exceptionally well in basements. Vinyl flooring, which can be easily installed over concrete, is durable and easy to maintain. This flooring comes in many styles and colors. Usually, the thicker the vinyl, the higher is the cost and quality. Some vinyl flooring even looks like real wood and stone. It’s easier to remodel a basement in a new home than it is renovating a basement in an older house. This is mainly because newer homes have more accessible stairs. Also, in most cases, the plumbing in newer homes is already in place for including an additional bathroom. If your basement doesn’t have carbon monoxide and smoke detectors, be sure to add them. To reduce the amount of noise from a newly constructed basement playroom or media room, install sound insulation in your basement’s ceiling. If you don’t have a sound break, noise can penetrate through the wood into your drywall, affecting the rest of your house. Allow for sufficient clearance for heating equipment. Contact your insurance agent to make sure that you have coverage for a finished basement as sometimes finished basements are not insured. Basement remodeling typically requires securing a building permit, along with an electrical permit. To learn more about basement remodeling, call the remodeling professionals at Pagenstecher Group. We do home renovations, kitchen remodeling and home additions. Please contact us and see what we have to offer.